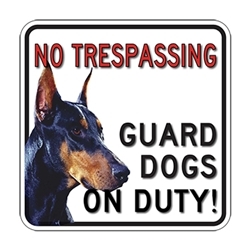 This attention-grabbing 18x18 size Guard Dogs on Duty with color photo of your choice of guard dog is large enough to display above 7 feet. Click for a smaller 18x12 Full Color Guard Dogs On Duty sign. DOUBLE the working life of your Full Color Beware Of Dog signs by adding 3M Protective Overlay Film (POF)! 3M’s high-tech POF protects sign faces against fading caused by the sun and harsh weather—and makes graffiti and sticker defacement damage easy to clear away without harsh abrasives.